Since the first report of a practical OLED by Tang and VanSlyke in 1987, metal complex, silole, oxadiazole, and triazole derivatives have been mainly used as an ETM (Tang and VanSlyke 1987; Kulkarni et al. 2004; Hughes and Bryce 2005; Sasabe and Kido 2011, 2013a, b; Xiao et al. 2011; Yook and Lee 2012; Chen et al. 2014). ETMs perform several important functions. The key requirements for multifunctional ETMs are (1) good electron-injection properties, (2) high electron mobility, (3) high hole-blocking ability, and (4) sufficient triplet energy for exciton blocking. 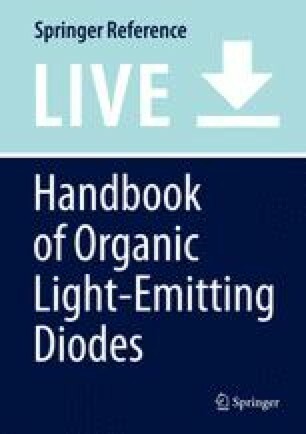 As a representative example, 8-hydroxyquinoline aluminum (Alq) is a well-known material that is widely used for fluorescent OLEDs; however, Alq cannot be used in second- and third-generation green or blue OLEDs due to its low ET of 2.15 eV (Montes et al. 2007). Therefore, researchers have spent the last decade searching for novel ETMs with high ET. Figure 1 shows a number of representative ETMs and the relationship between chemical structure and triplet energy. A typical strategy to reduce π conjugation involves using twisted and/or nonconjugated skeletons, such as meta-conjugation, tetraphenylsilane, triphenylphosphine oxide, and triphenylborane, to generate ETMs with high ET in the range of 2.7–3.3 eV, which is higher than that of a typical wide-energy-gap ETM such as 2,2′,2″-(1,3,5-benzinetriyl)-tris(1-phenyl-1-H-benzimidazole) (TPBi, ET = 2.70 eV) (Kim and Lee 2014). The phenylpyridine derivative TpPyPB was developed by Su and Kido and has a superior μe of 7.8 × 10−3 cm2 V−1 s−1, as measured by the time-of-flight method, and a relatively high ET of 2.57 eV (Su et al. 2008). The bipyridine derivative 1,3-bisbipyridyl-5-terpyridylbenzene (BBTB) was developed by Ichikawa and has a superior μe of ~10−3 cm2 V−1 s−1 and a relatively high ET of 2.53 eV (Ichikawa et al. 2012). 3-(4-Biphenylyl)-4-phenyl-5-(4-tert-butylphenyl)-1,2,4-triazole (TAZ, ET = 2.67 eV) and 2,9-dimethyl-4,7-diphenyl-1,10-phenanthroline (BCP, ET = 2.63 eV) are well-known wide-energy-gap materials (Sasabe and Kido 2013a). However, these materials have a lower ET than emitters in second- and third-generation blue OLEDs, so they are not suitable ETMs for these types of OLEDs. 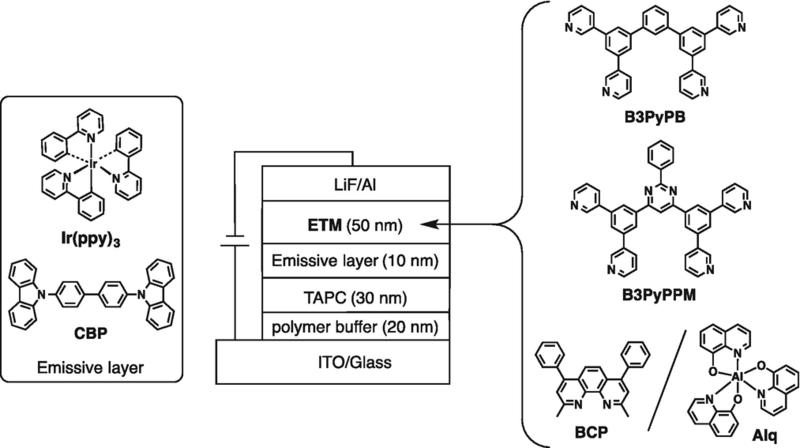 A phosphine oxide derivative, 2,6-bis(4-(diphenylphosphoryl)phenyl)pyridine (BM-A11) developed by Padmaperuma has a high ET of 2.7 eV, and a FIrpic-based OLED with BM-A11 has a maximum power efficiency ηp,max of 48.4 lm/W and an external efficiency ηext of 14.9% (Von Ruden et al. 2010). 1,3-bis(4-(diphenylphosphoryl)phenyl)benzene (BPOPB) developed by Pu and Kido has a high ET of 2.79 eV and is used in solution-processed multilayer small-molecule OLEDs (Aizawa et al. 2014). A polyboryl-functionalized triazine derivative, 2,4,6-tris(m-dimesitylborylphenyl)-1,3,5-triazine (B3T), was developed by Wang and has a very high ET of 3.07 eV. An Ir(ppy)3-based OLED with B3T showed a maximum current efficiency of 68.9 cd/A and an ηext of 19.8% (Sun et al. 2011). A poly(diphenylphosphoryl)phenyl-functionalized triazine derivative, 2,4,6-tris(3-(diphenylphosphoryl)phenyl)-1,3,5-triazine (PO-T2T) developed by Wong has a very high ET of 2.99 eV (Lee et al. 2015; Hung et al. 2014). A FIrpic-based OLED with a combination of PO-T2T and N,N2-dicarbazolyl-3,5-benzene (mCP) as exciplex host has an ηp,max of 66 lm/W and an ηext of 30.3% (Lee et al. 2015; Hung et al. 2014). One of the most important possibilities offered by multifunctional ETMs is to make a carrier- and exciton-confining structure that not only minimizes triplet exciton quenching at the HTM/EML and/or EML/ETM interface(s) but also creates a better carrier balance between holes and electrons in the EML. A representative example of OLED configuration using bis-4,6-(3,5-di-3-pyridylphenyl)-2-methylpyrimidine (B3PyMPM) as ETM is shown in Figs. 2 and 3. Kido and co-workers reported an ultrahigh efficiency fac-tris(2-phenylpyridine)iridium(III) [Ir(ppy)3] device based on the high-ET ETM B3PyMPM, which was used not only as host material but also as HTM and ETM with high ET (Tanaka et al. 2007). The B3PyMPM-based device has an ηext of 29% (105 cd/A), 133 lm/W at 100 cd/cm2 at an operating voltage of 2.5 V, and an ηext of 26% (96 cd/A), 107 lm/W at 1000 cd/cm2 at an operating voltage of 2.9 V.
To date, a large variety of ETMs and device structures has been reported. An OLED is a multilayered device that typically consists of HTM, EML, ETM, electron-injection layer, and metal cathode. The number of combinations of materials and thicknesses is unlimited. Therefore, a fundamental question is how the ETM influences the OLED performance and what kind of chemical structure leads to high-performance OLEDs; in other words, the relationship between chemical structure, physical properties, and device performance should be investigated and understood. To address this question, Sasabe and Kido systematically investigated the effect of the ETM in phosphorescent green OLEDs (Sasabe and Kido 2011). Ir(ppy)3-based green phosphorescent OLEDs with different ETLs, i.e., 3,5,3,5 -tetra-3-pyridyl-[1,1;3,1]terphenyl (B3PyPB) (Sasabe et al. 2008a), 2-phenyl-4,6-bis(3,5-di-3-pyridylphenyl)pyrimidine (B3PyPPM) (Sasabe et al. 2008b) and BCP/Alq have also been reported (Fig. 4). Figure 5 shows the luminance voltage (L-V) and power-efficiency–luminance (PE-L) characteristics. B3PyPB- and B3PyPPM-based OLEDs offer superior performance with an ηp,max of 118 lm/W (ηext,max = 29%) and 140 lm/W (ηext,max = 29%), respectively, which is approximately 1.5–1.7 times greater than for the reference with BCP/Alq. The operating voltage is much lower for a B3PyPPM-based OLED than for a B3PyPB-based OLED (2.6 and 3.2 V, respectively, at 100 cd/m2), although μe for B3PyPPM is three orders of magnitude lower than for B3PyPB. Such a reduced operating voltage is attributed to deeper electron-affinity (Ea) levels in B3PyPPM. In 2010, Su and Kido developed a triazine-based ETM called Tm3PyPhTAZ, which offers 100 cd/m2 at 2.4 V in an Ir(ppy)3-based OLED (Su et al. 2010). In 2013, Sasabe and Kido developed an Ir(ppy)3-based OLED with extremely low operating voltage and a turn-on voltage of 2.07 V at 1 cd/cm2, 100 cd/cm2 at 2.25 V, and 5000 cd/cm2 at 2.95 V with no light-out-coupling-enhancement techniques (Sasabe et al. 2013). The turn-on voltage of this device was 0.20 V lower than photon energy of Ir(ppy)3 (hν/e = 2.38 V, λEL = 523 nm). The reason for a low turn-on voltage can be attributed to the thermally activated carriers. It is very informative for materials chemists to study how optical properties change over a series of related materials. A representative example is the series of 2-methylpyrimidine skeleton-based ETMs (Sasabe et al. 2011). In 2011, the Sasabe and Kido group designed and synthesized a series of bis-4,6-(3,5-dipyridylphenyl)-2-methylpyrimidine (BPyMPM) derivatives as ETM and used BPyMPM derivatives to investigate how nitrogen orientation affects the physical properties (Fig. 6). Each of these BPyMPM derivatives has a different nitrogen orientation in the peripheral pyridine rings. 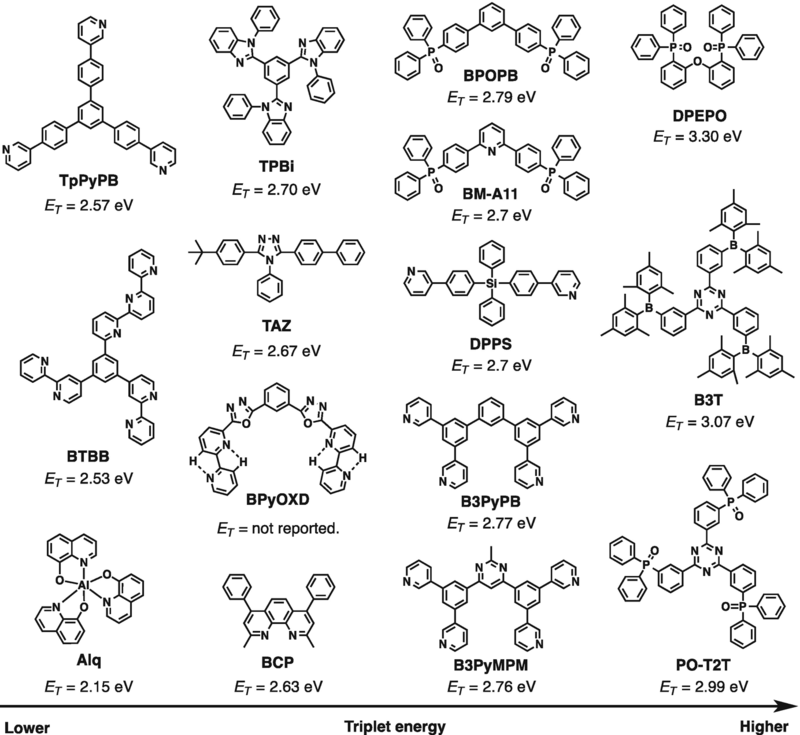 The optical properties of BPyMPM derivatives were determined by ultraviolet photoelectron spectroscopy (UPS) and ultraviolet-visible absorption spectroscopy. From the UPS data, Ip was determined to be 6.62 eV for B2PyMPM, 6.97 eV for B3PyMPM, and 7.30 eV for B4PyMPM. The HOMO of BPyMPM derivatives is mainly located on the dipyridylphenyl moieties. Therefore, the electron density of the HOMO is considered to depend on the peripheral pyridine rings. 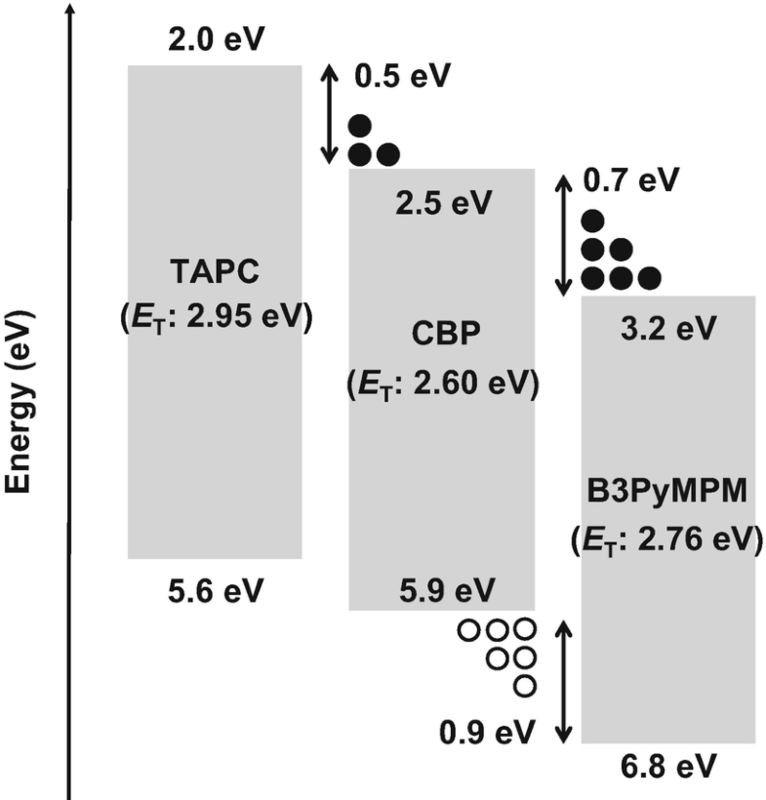 The electron affinity Ea was estimated by subtracting the optical energy gaps Eg from Ip, which yielded 3.07 eV for B2PyMPM, 3.44 eV for B3PyMPM, and 3.71 eV for B4PyMPM. Although only slight structural differences exist between these compounds, Ip and Ea differ significantly. The position of the substituted pyridine rings thus appears to be the key factor in determining the optical properties. Time-of-flight measurements in vacuum-deposited films have also been conducted to determine μes. At room temperature, μe for B4PyMPM is 10 (100) times greater than for B3PyMPM (B2PyMPM). The performance of an amorphous solid film can be improved through sophisticated manipulation of weak intra- and intermolecular interaction(s). A representative example is the weak CH/n (n: lone pair) hydrogen bond (H-bond) (i.e., CH/O and CH/N). The binding energy of this weak CH/N H-bond is estimated to be 10–20 kJ/mol, which is about half the energy of a typical H-bond (20–30 kJ/mol) (Sasabe and Kido 2013b). Figure 7 shows an example of intramolecular CH/N hydrogen bonds in OLED ETMs available in the 2,2′-bipyridine derivative 1,3-bis[2-(2,2′-bipyridin-6-yl)-1,3,4-oxadiazo-5-yl]benzene (BpyOXD) developed by Ichikawa et al. in 2006. BpyOXD has a high μe of 3.1 × 10−3 cm2 V−1 s−1 (Ichikawa et al. 2006, 2007). Compared to 1,3-bis[2-(4-tert-butylphenyl)-1,3,4-oxadiazo-5-yl]benzene (OXD7), BpyOXD showed superior performance in an NPD/Alq device with a much lower driving voltage. Later in 2009, Yokoyama et al. investigated the molecular-aggregation state of OXD7 and BpyOXD by using VASE. They reported that the intramolecular CH/N H-bonds of the pyridine rings cause the molecules to become planar and promote horizontal molecular orientation, leading to high μe (Yokoyama et al. 2009). An alternative is to use 3- and/or 4-pyridine derivative(s) of BPyMPM derivatives, which take advantage of the intermolecular hydrogen-bond network. In 2011, Yokoyama and Sasabe reported the molecular orientation and intermolecular CH/N H-bonds in BPyMPM derivatives by using a variable-angle spectroscopic ellipsometry (VASE) and infrared (IR) spectrometry analyses (Yokoyama et al. 2011). They pointed out that B3PyMPM and B4PyMPM give highly oriented films that are likely driven by CH/N hydrogen bonding. In 2015, Sasabe and Kido developed triphenyltriazine-based BPyPTZ derivatives with a combination of intramolecular and intermolecular hydrogen bonds that result in a strongly horizontal orientation and a low operating voltage in OLEDs (Watanabe et al. 2015). A planar molecular orientation can be actively manipulated by the synergetic effect of intra- and intermolecular CH/N H-bonds. Table 1 summarizes the optical and physical properties of ETMs. To boost the efficiency of second- and third-generation OLEDs, a key challenge is to achieve both good electron-transport and high ET within a single molecule. Although Alq is a well-known material and is widely used for fluorescent OLEDs, it cannot be used in second- or third-generation green or blue OLEDs due to its low ET of 2.15 eV. Therefore, over the last decade, researchers have been searching for novel ETMs with high ET. A typical strategy to obtain ETMs with high ET is to use twisted and/or nonconjugated skeleton(s), such as meta-conjugation, tetraphenylsilane, triphenylphosphine oxide, and triphenylborane to reduce π conjugation. Another interesting approach is to engineer the solid-state aggregation through sophisticated manipulation of inter- and/or intramolecular interactions. A successful example of this is to use the weak hydrogen bonds in CH/N. In the near future, active control of molecular assembly and/or of the aggregation state in the solid state should drastically improve the carrier mobility. Then, OLEDs with low operating voltage and high power efficiency could be developed based just on a simple device structure.